(In Florida, it has been summer for a few months. I kind of wish someone had waited to tell the state that it was summer until like, today. Humidity is nothing to celebrate, y'all.) Since it's finally and officially summertime -- and the dream Emmy ballot mini-series will continue to roll out in the coming days and weeks -- that means we're returning to our season-specific series: Summer Lovin'! Be sure to check the tag if you missed the first three weeks because we've all been loving a whole lot of fun series, webseries, movies, and books over the past month. We would hate for you to miss out on these gems as well. Why she's lovin' it/him: It is a truth universally acknowledged that I hate watching the news. I used to go to a gym where the only stations that were available on the ellipticals and treadmills were Bravo, HGTV, ESPN, and local news. I always avoided the local news with fervor. I would literally watch a half-hour broadcast about a sport I didn't care about than watch a half hour of robberies and deaths and people generally being terrible to each other. So when I say that I get my news from John Oliver and Last Week Tonight, you can bet that I'm not being facetious. I first became aware of John Oliver not because of The Daily Show, but because of Community. He was the snarky, drawling friend of Joel McHale's Jeff Winger. He was hilarious in the few scenes he had and truly set the tone for the rest of the show's recurring characters. So when John Oliver got his own show, I thought: "This is something I'll be sure to promote." As it turns out, I didn't really need to promote the brilliance of John Oliver -- the Internet was more than happy to do that for me. Here's what's so great about Last Week Tonight: it's informative, while being funny and it's poignant in a way that few satirical news shows are. Because it's NOT satirical. Not really. No, see, John Oliver and his team found a way to deliver the news to people like me -- people who are loathe to actually watch the news. And they found a way to highlight what's wrong in the world and what's happening in current events without talking down to the audience. Because of Last Week Tonight, I was able to understand what net neutrality was. I literally kept hearing the phrase thrown around but it wasn't until the segment on the show that I recognized its definition and all it encompassed. See, that's what this show does so brilliantly and perfectly: it highlights what's wrong in the world, sure, but it does more than that. It explains terminology. When John Oliver talks about infrastructure or FIFA or online harassment, it's the first time I feel like someone is actually taking the time to inform me rather than sway me toward a political agenda. Last Week Tonight isn't a satirical news program. It's an ACTUAL news program. And yeah, sometimes there are dingoes and sometimes we break the Internet with hashtags and sometimes there are standardized test monkeys dancing around. But all the silliness and all of the humor makes the messages that much more important and memorable. And honestly, if you're not watching Last Week Tonight, you need to. Even if you don't get HBO, go watch segments on the YouTube channel. By the way, EVERYONE needs to watch John Oliver discuss online harassment and misogyny. Seriously. Just... do it. Why she's lovin it: Confession time. I've never watched The Bachelor. Or Joe Millionaire. I did watch Who Wants To Marry A Muti-Millionaire in 2000 and even at the tender age of 13, I remember my skin crawling as women flung themselves at the slimy Rick Rockwell, literally parading around in bikinis. I can still perfectly picture the look of frozen uncertainty and disbelief on Darva Conger's face as they swept them away to go through with the actual wedding ceremony. I had never had a boyfriend, but I knew that this wasn't the look of love or romance. It looked like a Miss America pageant gone horribly wrong. That memory has always stuck with me and made it hard to enjoy any of the fluffy dating shows, though I gave one season of The Bachelorette a shot. I rooted for Allie, but the shadow of Rockwell and Conger loomed, and I couldn't help but feel that even though the show was all about the woman calling the shots, she still seemed like a marginalized commodity. When I try an articulate my love for Lifetime's new series UnREAL, the best I can come up with is that it is the exact opposite of how Millionaire made me feel. This is a world where the women are calling the shots. They're the big wigs. They're the power. Sure, on the surface it's a Bachelor-like dating show with beautiful women vying for the attention of one man, but oh man is it so much more. The focus is on the producers on the show: fierce, crass, do anything for ratings Quinn and her mentee Rachel, a woman barely recovered from her very public breakdown and a talent for manipulation. These two are blowing the strong female character archetype right out of the water. They have love interests, but their lives don't revolve around men. They're workaholics, but they're not shrews. They lie, they swear, they put these poor contestants through hell. They're both cynics in the worst way, peddling love like cigarettes in the 1950s. They are antiheroes and dang if I am not rooting for both of them. Besides the amazingness that is Rachel and Quinn, this is quite frankly mighty fine summer TV. There is romance, betrayal, plot twists and intrigue. Every hour is packed with plot and attractive people doing devious things. It's fun, and it makes you feel (and sometimes think, but not too much). Not only do I root for Rachel, I hope for her. So, if you aren't already watching UnREAL, if you were turned off by the station it's on or the dating show premise, do yourself a favor and check it out. At the very least it may take the bitter taste of Who Wants To Marry A Muti-Millionaire out of your mouth. Why she's lovin' it: I’m one of those people. I can’t help it. I’ve grown up online, and I’ve waited for the release of many, many books (I may or may not have been in line at midnight in front of a bookstore dressed up as Hermione for one… two… okay, maybe three Harry Potter books) and new episodes of my favorite TV shows, so how could I not? I LOVE speculation. Sometimes I think I enjoy the hiatus between shows nearly as much as I enjoy having new episodes to watch every week. Game of Thrones has hit the high point of the speculation game in the past few days. For the past four years I’ve used my knowledge as a shield. I knew more than the people watching week to week, so I suffered less, I enjoyed more. I prepared myself mentally for the losses, and savored each and every win. Hell, I even made fun of others from time to time. I gave out ominous advice: Don’t get attached! My friends probably hated me. And then the TV show caught up to the books and the eternal summer of speculation/theorizing began. I was afraid. I loved speculation, yes, but I was unused to being on equal grounds with the hordes of Game of Thrones fans. Maybe I’d hate it. Maybe I’d already exhausted all my possibilities four years ago, when I finished book five. Maybe I had nothing left to give! It’s been only two weeks since the season finale, but I already find myself wishing the TV show wasn’t coming so soon. I need to get my head examined, my boyfriend would say. But with casting calls, principal photography and filming next month, we have more real information than we’ve had in four years. And, with that, we have more space for theorizing. And I excel at theorizing. Really, I do. I can come up with at least four plausible scenarios for almost every storyline that has been left hanging. I remember obscure names and can cite hard-to-remember references. That’s just who I am. An OCD-suffering, crazy, obsessed writer. And damn proud of it! Why she's lovin' it: Simon Pegg owns every single minute of Hector and the Search for Happiness. Not only does he bring his typical humor to the role, he brings affability, charm, and profound vulnerability. In a word, the experience of watching him take Hector on a global search for happiness, is unexpected. Hector begins the movie with a stable, seemingly fulfilled life. He has a great job, an amazing girlfriend, and a good condo with a view. He has what many people scrape and fight to achieve throughout their lives. He is also insanely bored, living in the past, and unfilled. 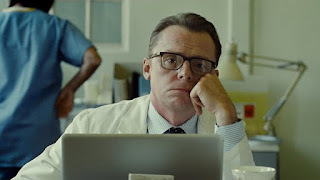 Simon Pegg is able to bring an everyman quality to the boredom that prevents stereotyping the rich, white man’s plight of not wanting what he has. You can feel his palpable frustration with himself and his life. He cannot commit properly to any of it, including his girlfriend, who he clearly loves, played by Rosamund Pike. He wants more, only he doesn’t exactly know what more really means. He wants to find happiness, and he’s determined to see if he can find it. Leaving behind his girlfriend – with a giant question mark as to the status of their relationship going forward – and his thriving therapy practice, he heads off into the world to see what brings other people happiness and if he can take those things and apply them to himself. It’s a midlife crisis disguised as research, but it is the first real thing he’s done to change the stasis of his life since college. Hector moves through several countries and has interactions with a variety of vastly different people – a banker, a prostitute, a monk, a doctor, a mother, a drug dealer, kidnappers, a cancer patient, and an old flame – and they all have varying ideas of what happiness means to them. They give him wisdom, even if that wisdom is in the swiftness in which a life can end. Throughout it all, Simon Pegg brings to Hector terror, wistfulness, hope, burning curiosity, and, above all, the sense that Hector is as flawed and lost as the rest of us. It’s easy to connect to Hector’s sense of stagnation and fear that he’s missing something in his life, as we have all had those same fears, if only quietly. He moves through the lessons with the same curiosity and ability to listen. He wants to understand them so he can understand himself. It is Simon Pegg at his finest. And by the time his situation with the kidnappers is resolved, you just want to give the man the biggest hug in the world – or maybe celebrate with some sweet potato soup. It’s not until he talks to his old flame, played by Toni Collette, who quite easily steals every scene she’s in, that he begins to understand that living in the past is part of his problem. He’s not happy because he’s unwilling to let go of what is no longer serving him and accept the person he has become. After an emotional conversation with his girlfriend, the walls that have kept him from committing to the present start to tumble down. The scene takes place in a small room, the entrapment somehow liberating, and is equal parts beautiful, hopeful, and emotional as Pegg cries, laughs, and allows Hector to find his happiness once and for all. The moral may be in allowing happiness in every moment, by feeling all the things that make us human and centering them in the present, but the story would not have nearly as much zing or heart without Pegg in the lead. He is the heart of the movie in a way few actors are. His nuanced performance adds an extra layer of enjoyment to the movie, and has you rooting for him even in his character's most selfish moments. If you watch anything this week, let it be Hector and the Search for Happiness. Why she’s lovin’ it: Okay, look. I love summer movie season. It’s when you get the biggest blockbusters and some of smaller indies that just want you to love them. Something I’m definitely not looking for in my summer movie experience is completely and utter emotional destruction. But don’t worry, my lovely friends. Inside Out decided to disregard that and rip my soul open. When Riley is born, there’s a dark cavern insider her head. As she looks at her parents and the coo over her, we first meet Joy. It’s so sweet. Then we meet Anger, Fear, Disgust and Sadness. These are the emotions inside Riley’s mind. They help her feel and react to everything and watch as the memories stack up and marvel when a core memory adds to the personality islands between headquarters and long-term memory storage. When Riley’s family moves from Minnesota to San Francisco, Sadness starts to step up and Joy doesn’t like it. She just wants Riley to be happy. When Sadness touches a core memory and it turns from pure yellow to tinged with blue, Joy tries to fix things and ends up setting herself and Sadness on an adventure through Riley’s mind in an effort to get back to headquarters. Listen, as per Pixar’s obvious contractual obligations, we all know we’re going to cry. But this one was different. They were smart with the promotion for this one. They omitted one of the most emotional aspects, Riley’s imaginary friend Bing Bong, from the trailers as he was not an emotion but rather a part of her subconscious. Ergo, literally NO ONE WAS READY FOR THAT GUY. Joy and Sadness meet him in long-term memory and he helps them to get back to where they need to be. When he’s sad about Riley maybe forgetting him, Sadness comforts him and Joy realizes that maybe Riley needs Sadness in order to feel Joy. His sacrifice in order to help Joy really ripped my heart, soul and being in half and I am still not okay a week later. The general message, to be a-okay with your feelings and understand that it’s okay to be sad and have emotional range, went over the heads of the kids I took to see it, but it was just so beautiful. Did it make me cry like Up or Toy Story 3? No, but that's because those movies want to crush everything in my soul. But I still cried. I’ve also read that they had a team of doctors on call to make sure they were getting the film right and that they got most of what we know (which is surprisingly not all that much) of the human brain and how memory works correct. They do their homework at Pixar and I can appreciate that. Plus, I just think it's really important to have a female protagonist that's as complex as, you know, a normal female is. And that it's okay to feel everything and not be ashamed. A+, guys. Also, as per usual, there is an adorable short before the movie. This one is about two volcanoes who just want to find love and then eventually wind up wrapped around each other singing a song about how they’re in love. I mean, COME ON. Go see it. NOW. Why she's lovin' it: Following our leader Jenn’s advice, I decided to binge watch Chasing Life on Netflix and 17 episodes later, I can say that I am hooked. Thank goodness the new season starts in less than two weeks so I can stop rationing episodes. Lately I have only been watching shows that can pass the Bechdel Test -- a standard so low that you should be able to step over it -- and this show passes the test with flying colors. The show has four women in the main cast and plenty of wonderful supporting characters. The relationships between these women is what I think makes the show amazing. I want to focus on just three of them because I could write a novel on this show. Of course, spoilers ahead! Our protagonist April Carver has always been a perfectionist and the person you go to when you need help. She is tough and stubborn, so when she is diagnosed, she finds that she is terrible at asking for support. She tries to keep her cancer a secret from the ones closest to her because she thinks it is never the right timing for them when she is really the one who is not ready to say it. The diagnosis becomes more real with the more people she tells. Her best friend Beth is the first person to find out and instead of being a flaky friend, she downloads apps to monitor April's symptoms and takes her to doctor appointments. She is April’s rock and does not push April to tell her family until she’s ready. Beth also doesn’t go out of her way to make April's family ask April what is wrong, when she very well could. She is a sounding board and helps April have fun and live her life. She is the best friend we all deserve. April's sister Brenna is a rebellious teen, trying to figure out her sexuality and dealing with her friendships. She finds out about her sister’s cancer while they are in the middle of a huge fight that ends with April storming out. Even though things ended terribly, Brenna tracks her sister down at her biopsy and does not hesitate to test herself to see if she is a possible match for a bone marrow transplant. She could have easily been the bratty younger sister and she turns out to be the most selfless character in the show. I highly recommend everyone to watch the show and meet all the other wonderful characters that I did not have time to mention. You will probably cry a lot but laugh even more. I have to figure out how to ration four more episodes until July 6th! I just wanted to comment and say, JEN, I watched that John Oliver clip, and wow, you were right. I might have missed it if it weren't for this. Thank you! I am really enjoying this series! I love hearing about this collection of things people are finding enjoyable. It may not always be my taste but I will also find a few wonderful things I would otherwise have missed. This is the beauty of person to person recommendation and enthusiasm. Thank you for providing it ladies! And Jenn, John Oliver is absolutely brilliant and I'm so pleased you highlighted his work on LWT. I fell in love with him back on the Daily Show before I saw him on Community (did you see his little shout-out to Community in the segment about student debt?) and he is such a joy.